Maastrom Farm is one of the stars of Bedford’s annual Garden Festival. 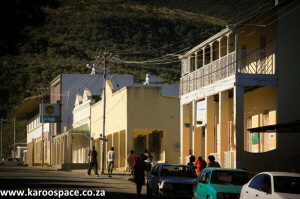 After good summer rains, the little town of Bedford on the eastern edge of the Karoo looks like part of the Hobbits’ beloved Shire. Everything is pea green and trees meet over streets to form tunnels. Geese waddle bossily along the pavements. The Cape parrots gorge themselves on yellowwood nuts up in the striped Kaggaberg mountains nearby. Fallow deer and kudu invade gardens to eat roses and lettuce. Bedford has a rare constellation of green assets. There are women here who have built on gardens that go back hundreds of years, creating beauty on faraway farms and in the town itself. Many Bedford gardens have been featured in magazines over the years. Gardeners are challenged by the clay soils and brackish groundwater, but at least have rainfall above 500mm year – a figure considered quite generous in a region that barely sees above 350mm a year. 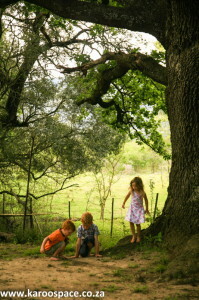 Bedford’s gardens are a delight for children too. Also, there are good deep frosts in winter which prime the roses, kill pests and are great for berry and fruit trees. 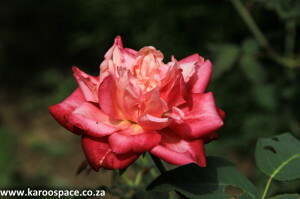 She tells the story in her book Roses at the Cape of Good Hope, first published in 1988 and now a classic. Gwen found 60% of South Africa’s remaining old roses in the Eastern Cape Midlands, the thickly petalled, cabbagy beauties still growing in and around Graaff-Reinet, Bedford, Cradock, Somerset East, Hogsback and Grahamstown. They were scrambling up massive old trees, over farm buildings and graveyard fences. Some were well over 100 years old, but still they were flowering cheerfully every spring, their unmistakable fragrance rising in the clean Karoo air. The lovely heritage rose General Gallieni, ancestor of modern roses. Many had been brought here by the 1820 British Settlers. Others had been ordered as bare root stock and arrived by ship. Because they thrived and were trouble-free, they had generally been left to grow undisturbed. Heritage and old roses need very little cosseting, spraying or pruning. They are hardy and headstrong, and far more disease- and drought-resistant than their modern counterparts. Plant them near a tree and they will soon clamber up it and poke their pretty heads out the top. 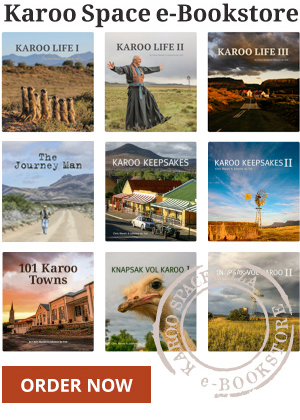 Gwen’s book inspired some Karoo members of the South African Heritage Rose Society to seek out the old roses and take slips to cultivate, just in case something happened to the originals. The beautiful Fanny la France, a heritage rose. Armed with secateurs and gloves, they jokingly referred to themselves as Rose Rustlers. They went on the hunt, clambering through barbed wire fences to roses flowering all alone on deserted farmsteads. They travelled around the district, their eyes trained to catch glimpses of these old roses in gardens and graveyards and old mission stations of the Eastern Cape. Clearly a sanctuary was needed for these precious living antiques and the choice fell on Bedford, in part because the town had hosted a Garden Festival since 2003, and the area is full of keen gardeners. 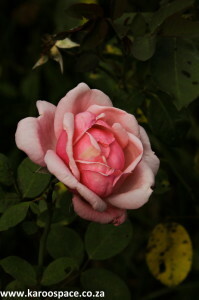 Part of a piece of ground called the Camelot Arboretum was set aside, and the first roses carefully planted in October 2011. Centuries ago the main function of roses was to be beautiful and impenetrable hedges. Roses planted only three years ago in the Rosarium are growing tall and happy in the company of agapanthus, sutera, pelargoniums and a gigantic boerboon tree. 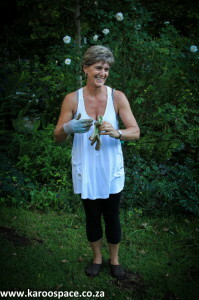 Kim van Niekerk, legendary gardener and one of the Garden Festival founders. Here you will find 60 rose varieties hardly ever seen in modern gardens. They have quaint names like Mermaid, General Gallieni, Maiden’s Blush, Pompon la Bourgogne and Fanny la France. “A big part of the excitement is around the stories of the roses. Where did they come from? 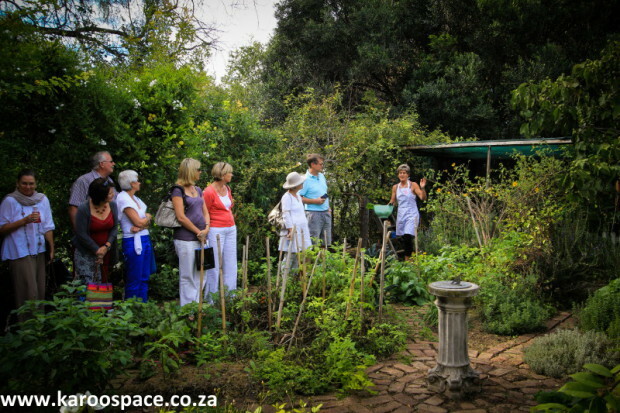 Where were they found?” explains Kim van Niekerk, a farmer’s wife, legendary gardener, estate agent and one of the founders of the Bedford Garden Festival. Bedford’s green fever has spread. The local township, Nyarha, is now a firm favourite on the Garden Festival circuit. 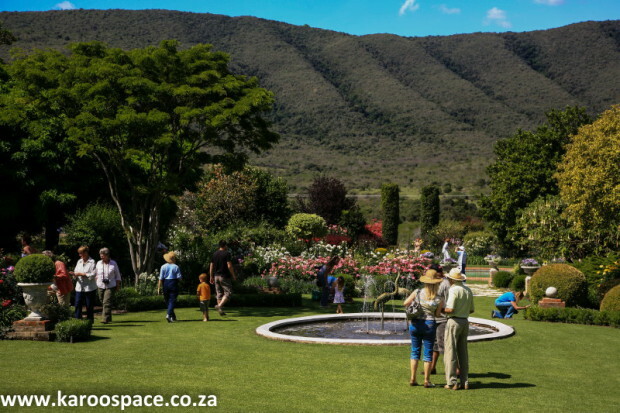 Maastrom farm on the edge of Bedford is one of the greatest garden attractions, and one of its former gardeners, Maxham Mahleza, has used his green thumb to great effect in the township – his dedication and talent kept flowers blooming during a terrible drought that broke three years ago. Victoria and Maxham Mahleza create beauty in Bedford’s Nyarha township. The Department of Environmental Affairs have funded two community gardens in nearby Adelaide and two in Bedford. In all four cases, derelict pieces of land were landscaped them and have transformed out of all recognition, turning them into great assets for the towns. Adelaide now has a medicinal and fruit garden, and a botanical and aloe garden. 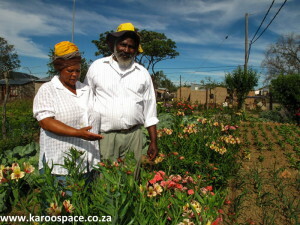 Bedford has a vegetable garden with a bird-attracting wetland, and a memorial garden to the heroes of the struggle which also has a nursery area for plant propagation and sales. Kim van Niekerk oversaw the creation of the gardens, brought in tons of organic mulch and fertiliser, and taught dozens of new gardeners about plants, sourced the tallest trees she could find to survive the droughts and frosts, and hunted all over the province for plants. “I just wish you could have been here when the first truck arrived and the new employees stood looking all withdrawn and mistrustful. I told them that gardeners need to be happy and cheerful. Slowly a human chain formed and by the time the truck was offloaded everyone was singing and laughing. 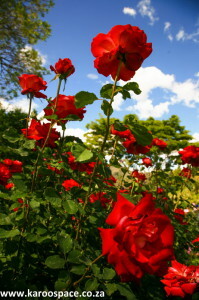 The roses are usually at their best during the Garden Festival. Bedford’s Garden Festivalis held every year over the last weekend of October – a celebration of the region’s green beauty. But edible gardening has always been something of a theme in this fertile region. The Garden Festival will be held from 23 – 26 October 2015. Check for updates and news on http://www.bedford.co.za and http://www.bedford-gardens.co.za. Bedford specialises in edible gardening, which makes it a natural for a Garden and a Food Festival.